Author's note: For Liz, because she said the lyrics were ficcable and then provided the hook I needed to get started. This story takes place after the episode "Never Again" and just before "Momento Mori." Minor spoilers for "Leonard Betts," "Nisei" and "731" as well. Thanks to Liz Logan, Jerie and Liz Barr for their help on this story. Feedback is very much appreciated at seemag1@yahoo.com. The shrill ring of the phone jarred her awake. Her eyes, heavy with sleep, remained partially closed as she fumbled for the phone. Scully fell back against the pillows, pressing her hand to her forehead in irritation. "Do you know what time it is, Mulder?" "Just after two in the morning." It amazed her just how awake he sounded. "Most people are sleeping at this time, Mulder." There was a brief pause and in the background, Scully heard the television. Some mild panting, some shrieking, and overblown music. She decided not to ask Mulder what he was watching. In the meantime, Mulder's heavy breath was coming across the line with perfect clarity. "You didn't ask about Graceland, Scully." "I didn't know you had a thing for Elvis," she said. Her mouth felt dry, cottony. She reached for the glass of water on her bed stand and gulped it down gratefully. "Funny, after four years, the things I still don't know about you." "Yes." She shifted position slightly so she was able to touch the spot on her back where her new tattoo, the ourobus, had been dotted onto her skin just two days previously. The skin there was still red and inflamed; she'd applied religiously the ointment the tattoo artist had given her and remembered some time would pass before she had the clarity and color of the finished product. Dangerous territory now, she thought as she reflected on what she had yet to tell Mulder, and at this time in the morning -- the bright red glow of her alarm clock revealed it was 2:13 -- she wasn't sure she was up to a heart to heart with Mulder. Especially not about anything that had happened in Philadelphia. Though she regretted her words now, she knew she had to stick to her guns; not everything was about Mulder, though there were times when he was so close to her, so inside of her, she couldn't think clearly. Mulder cleared his throat. "Um, while I was in Graceland, I saw something you might be interested in." "What?" Scully blinked a couple times to focus her vision. "A weeping Elvis?" A little more awake now, Scully reached over and switched on the lamp on her bed stand. Her eyes blinked rapidly as she adjusted to the sudden brightness flooding the bedroom. "Yes. I stayed at a bed-and-breakfast, Scully. Owned by a Libby Michaels, and she has this statue of Elvis in her main foyer. Charges the renters five dollars to see it." "Impressive." Scully supressed a yawn as she tipped her head to the side, watching the shadows cast against the far wall of her bedroom. "It's pretty amazing. I mean, you hear and read, about it all of the time and there it is, in real life, putting on a show like no one else. I was half expecting the statue to get up and do a twist for me, you know, a rendition of 'Jailhouse Rock.'" "Statues don't bleed or weep, Mulder." "There's a millennia of evidence backing up the phenomena, Scully." She could hear the eagerness in his voice. "And many weeping and bleeding statues have been revealed as hoaxes. You should know that." Scully put her hand to her mouth, trying to muffle yet another yawn. "You should get some rest, Mulder. You've had a long week." "I *was* resting. And then you called." "I wanted to tell you about the statue." "And I'm telling you it's a hoax, that this Libby Michaels has pulled one over you. She saw in you the quality necessary and she showed you the statue, and of course you fell for it." "And what quality is that, Scully?" Mulder sounded playful, almost seductive. She sighed. "Gullibility, Mulder. You want so much to believe and you get carried away on your emotion. No doubt Libby Michaels saw that and capitalized on it." "It was real blood, Scully, and real tears." "You know how they do that, don't you? How they make those statues weep?" "I have no doubt that regardless of my answer to that question, you're going to tell me anyway." "One explanation involves a chicken baster--"
"You're turning me on, Scully." She ignored him. "And chicken broth. You squeeze the broth into the eyes and voila, weeping." "Those tears didn't taste like chicken broth." "You tasted it?" She tried to keep the note of incredulity out of her voice, but failed miserably. 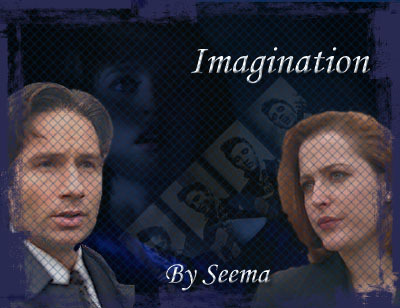 "I'm nothing if not thorough and sincere about my investigations into the paranormal, Scully." "I'm hurt, Scully." His tone became more insistent. "I'm telling you what I saw. It's a reproducible, viable phenomena, witnessed not only by myself and Mrs. Michaels, but also one Harold Spencer from Boca Raton and a Darrah Martin from Beverly Hills. I'm telling you, it's a miracle, an honest to God sign from the Big E himself, a sign of his second coming." "I find it unlikely Elvis would announce his return through some porcelein figurine of himself." Scully shook her head and once again, shifted position to get more comfortable. "The more logical explanation is that the statue is hollow, made out of a porous material, like plaster or ceramic, and then coated with a glaze of some kind. The statue is then filled with a liquid of some kind--"
"-- but the glaze keeps it from leaking it out. So all someone would have to do is scratch away the glaze around the eyes and voila, Elvis weeps and bleeds." "You really know how to take the sexiness out of the religion, Scully." Scully turned to look at the clock. It was now almost three o'clock. "Is that all you wanted to tell me, Mulder?" "Well, yeah, I tried to call you, you know. When I saw Elvis weep the first time, but, you didn't pick up the phone." It was impossible to miss the hurt underlying Mulder's tone. Scully resisted the impulse to apologize. "I was on a case. A case you sent me to investigate." There was silence. Then Mulder cleared his throat. "I'm sorry about that, by the way." She really didn't feel like discussing this now. "It's all right, Mulder." She closed her eyes. "I'm fine, Mulder. We're fine." "Forced vacations are hell, you know. Even if you get the spiritual opportunity of a lifetime. You can't help but wonder what you're missing back at the office, the things that might come up. The possibilities, you know, of resolution of some kind. And I'd have missed it, because I was in Graceland, and there you were, having all of the fun in Philly, not to mention cheese steak like you can't get anywhere." She remained quiet, her fingers clenching the phone tightly. "That's all I wanted to say," Mulder said hesitantly. Scully twisted the edge of her comforter in her hand. "You didn't miss anything, Mulder. I promise." "I guess. But still. It's the principle of the matter." He cleared his throat. "I missed the tattoo parlor and you missed Elvis." "I didn't miss anything, Mulder. Statues bleed and weep all of the time." Her throat felt scratchy. "As I said before, many such phenomena have been revealed as hoaxes, preying on the suggestibility of those who want a sign of some kind so desperately, they are willing to forgo their own logic and intuition to believe it as a mark of divine providence." "Is that how you think I am?" Scully paused, thinking carefully. "Sometimes, Mulder, you are so wrapped up in your own world, your own quest, that you miss the big picture. You focus so closely on the details that give you the answers you seek that you get blinded by your own beliefs." "So you're telling me Elvis did not bleed and weep?" "In the flesh, he surely did, but it's highly unlikely in his current ceramic form." "You're breaking my heart, Scully." "It's not just enough to have faith, Scully. You need imagination as well." Mulder paused. "The imagination to believe that something might actually be true, a manifestation of something greater than you and me, greater than any logical and intuitive explanations. Enough so you can take it as a sign that this is a little thing, but you can extrapolate to larger, more extraordinary phenomena. A bit of imagination put a man on the moon, Scully. That's all I wanted to say." Scully reached for her water glass and was dismayed to discover it was empty. She put it back on the night stand with a resounding thud. "I'm going back to sleep now, Mulder. I suggest you do the same." "I'll see about getting you a desk first thing in the morning." "Don't worry about it, Mulder." "You were right. There won't be any room. And you know, we're hardly there. I'm sure in another couple days, you'll have yet another wild goose chase for us. Crop circles in South Dakota maybe or exsanguinated animal carcasses in Ohio." "One of these days, I'd like to take you on a pilgrimage to Graceland." "Trust me, Mulder, Elvis has left the building." Scully slumped further beneath the covers. "It's best to leave the poor man in peace." He sighed heavily. "You're probably right." "And Mulder? You don't need an excuse to call me." She kept her tone purposeful and even. "Yeah," he said softly. "I know, but, after today, I guess I just thought." "Yeah," she said. "But you thought wrong. I needed time and space to sort things out." "What kind of things, Scully?" Mulder sounded typically paranoid and suspicious. Scully wrapped the phone cord around her fingers, contemplating. She had not told Mulder what Leonard Betts had said to her, about wanting something she had, nor had she told him about waking up just a few nights ago in the middle of the night, and seeing blood -- her blood -- a bright and brilliant stain against the white pillowcase. In time, she thought, she would be able to accept what she was slowly learning about herself, what Penny Northern and the other abductees had warned her about the previous year. And in time, she would be able to tell Mulder. In the meantime, she could -- no, would -- imagine all within her was well and healthy, that her behavior in Philadelphia, the one night stand with Ed Jerse, was nothing more and nothing less than the desire to live. "I'm here." She cleared her throat. "Um, no." She bit her lip. "Why do I think there is something you're not telling me?" "Because I didn't ask you about Graceland?" "I'm fine, Mulder, and it's two, no, three, in the morning. Not the best time for a conversation." "It's all right," Scully said, immediately regretting her sharpness of tone. "Just so you know, if you wanted to go to Roswell tomorrow to check out the bright lights in the northwest skies, I will humor your imagination and faith long enough to get on a plane and check into another seedy motel with brown carpet and orange drapes and dinner from the local gas station." "Sounds awfully romantic and tempting when you put it that way, Scully." There was a pause and then Mulder said, "About your tattoo. The one you got in Philadelphia? Maybe we could have a little show-and-tell tomorrow?" She could hear the grin in his voice. "Good night, Mulder," she said. "I'll see you tomorrow. I'll hear about Graceland then." She took a deep breath. "And I have something I need to tell you." With that, she hung up the phone and clicked off lamp.